Anime: Members of the Anime Club study different forms of Japanese animation. These forms of animation are used in animated television series, films, video games and commercials, as well as print media, and literature. Students participate in an “Animarathon” at the end of the school year. Open membership. Art Honor Society: Students pledge to pursue and promote the excellence in the study of art. Membership by selection based on academic achievement. Baking Club: Students interested in baking meet to plan baking events and community service opportunities. Open membership. CCTV: Students learn to do the behind the scene work as well as how to broadcast a live television production. Members of CCTV use the latest technology to share daily news and weather reports to the student body. Interested students should see moderator for membership opportunities. Cathedral Scholars: This is Camden Catholic’s highly competitive program that is structured to challenge students academically and help them develop into leaders in the school community and the greater community outside of CCHS. The skills learned as Cathedral Scholars will lead to success in college. The goals of the program are to provide an academic environment that challenges students to be critical thinkers and apply knowledge learned to areas outside the classroom; build a strong educational foundation in writing and oral communication skills; encourage students to be active readers and apply and develop leadership skills; and offer students an education that provides them with a solid foundation in the core subjects but also prepares them for the academically competitive environment of college. Membership by selection. Christmas Concert: The band and choir perform in a special concert to spread the Christmas joy to members of CCHS and the local community. Cosmetology Club– Students meet to share tips and learn new skills as it relates to make-up, skin care and hair styling. Open membership. Dodgeball Tournament– Sponsored by Student Government, students compete on teams to determine the best at Dodgeball. Domenica and Langan Scholars: The Domenica and Langan Scholars meet regularly to support each other in the academic and social endeavors. Students learn about the resources available to them here at Camden Catholic and in the community and how to become self-advocates. Membership by selection. Costume and Make-Up Crew: Students assist with the drama department productions in the wardrobe and make-up areas. Open membership. Creative Writing – The Emerald Literary Magazine: Students and faculty write poems and stories and design artwork which is published in the yearly edition of The Emerald Literary Magazine. Open membership. Dance Team: Students learn ballet, tap, jazz, hip hop and other forms of modern dance, and design routines that they perform at games, pep rallies, and other school functions. Membership by selection. Drama – The Fall Production: Students present presents a play each fall. Play involves cast and crew. Cast is determined by audition, crew is open membership. Emerald Literary Society: This English Honor Society promotes the study of literature and correct speech, and the effective writing of English in all phases of their life’s endeavors. Membership by selection. Ethics Bowl: Students debate various ethics-related topics and compete in the Philadelphia Area High School Ethics Bowl. Successful teams can advance to the national championship held in the spring. Open membership. Field Band: The field band performs at school football games and pep rallies. Open membership but instrumental music experience needed. Film Viewing Club: a new club that will casually watch films that fosters a better appreciation of the genre in a social setting. Open membership. French Club: Students help to promote the French language through fundraising events as well as small workshops and field trips. Members assist with Open House, French Club Bingo, tutoring sessions, and the French Trip to Quebec City. Open membership. French Honor Society: Members of the Societe Honoraire de Francais promise to study the French Language in order to master it one day, and recollect that a language can be a strong tie between persons of differing origins, races or religions. Membership by selection. Freshmen BBQ: Freshmen come together for an evening BBQ celebration. This social event allows the students to socialize with their peers, enjoy delicious food, learn the results of the Freshman Government elections, and attend a home football game as a class. Green & White Society: Students are invited to join this special class that focuses on leadership skills that help the member become student ambassadors. Students represent Camden Catholic at high school nights, during guest days, visits to local grammar schools, and at Open House. Membership by selection. Investment Club: Students interested in the stock market meet and use an online simulation program to track investments and research company portfolios. Open membership. Jazz Band: Saxophone, trombone, trumpet, flute, clarinet, guitar and other horn and rhythm section musicians improve their talents and perform at Open House, concerts and other school events. Junior Ring Mass & Reception: Juniors come together to celebrate a special class Mass. Rings are blessed as part of the ring ceremony. A reception for juniors and their guests follows the Mass. Latin Honor Society: Members pledge to uphold and promote excellence in pursuit of Latin and to assist others in the study and understanding of the Latin language through the Latin tutoring program here at Camden Catholic. Membership by selection. Link Crew: Link Crew is a national orientation program. Junior and senior Link Crew leaders at Camden Catholic High School serve as mentors to the freshmen. The leaders work with the faculty moderator to help the freshmen become familiar with CCHS, its tradition of excellence, and to help them recognize that teamwork can help them overcome challenges. Membership by selection. Liturgical Choir and Musicians: Students have the opportunity to share their vocal and musical talents with their classmates and teachers through liturgical celebrations at scheduled school Mass, and at special events such as the Junior Ring Mass, Journey to Bethlehem, Living Stations of the Cross, and Baccalaureate. Open to choir students and those interested in serving as a music minister. Liturgical Assistants: Students work with Campus Ministry to serve as altar servers, lectors, and offertory for school Masses. Open membership. Math Club: Students use the skills and strategies they learn in their math courses to participate in several math competitions, as well as play games such as Sudoku, chess and crafts. Open membership. Math Honor Society: Members promote and pursue excellence in the study of mathematics. Membership by selection. Media and Technology Crew: Students supply and set up various media and technology equipment for faculty, staff, and activities. Open membership. Model UN: Students learn about current events in this simulation of how the United Nations functions. Students research information on the country they represent and defend their country’s policies and decisions during debate competitions. Open membership. Mr. CCHS: Senior boys compete in the evening wear, talent, and final interview competitions as they vie for the coveted title of Mr. CCHS. Members of the audience vote via text messaging for the individual they want to be crowned Mr. CCHS. Musical (cast) – Spring Production: Students learn the lines and dance moves to perform a CCHS version of a Broadway production. Membership by audition and selection. Music Honor Society: Members of the Tri-M Music Honor Society pledge to foster an interest and desire for excellence in music performance, encourage appreciation and awareness in listening to music, promote wider opportunities for sharing joy through music, and advance the spirit of good music and musical knowledge. Membership by selection. National Honor Society: Based on their academic performance students are invited to apply for membership into the NHS. Camden Catholic’s chapter works to foster the character, leadership, and service skills of those students who are involved, and to provide opportunities for local, national and international service to raise awareness of the greater need that exists around the world. NHS members provide tutoring to CCHS students and sponsor the group study nights before semester exams. NHS sponsors the annual Magical Morning with Santa in December. Membership by selection. Pro-Life: Students promote the sanctity and dignity of all life through prayer and advocacy. They also participate in the annual March for Life held in Washington, D.C. Open membership. Prop Crew: Students make the sets for school productions. Open membership. Reaching Everyone By Exposing Lies (REBEL): This is a tobacco prevention club that sponsors activities to educate students about the effects of tobacco usage. Members participate in Smoke Out Days, fundraisers and school clean-up projects. Open membership. Recyclables Collection Team: Students collect and ensure the proper disposable of recyclable items such as paper and plastic on a weekly basis. Open membership. S.A.D.D. – Students Against Destructive Decisions: Members plan various events such as Mr. CCHS, the Blood Drive, and Project Graduation, to raise money and create safe environments for students. Students also hold events to support Pediatric Cancer causes such as Go for the Goal and Alex’s Lemonade. Open membership. School Dances: Students can attend the Homecoming Dance in the fall as well as the class dances – Freshman Semi-formal, Sophomore Cotillion, Junior Prom and Senior Prom. Open to all students eligible. Science Club: Students are given opportunities to pursue science-related interests and to volunteer with the community in litter clean up and tree planting projects. Open membership. Science Honor Society: Members pledge that through their study of the sciences they will be good Christian stewards of the earth, appreciate and care for the natural world, and promote peace, justice and sustainable ways of living in the world. Membership by selection. Shakespeare Troupe: Students study the life and interpret William Shakespeare’s plays including select scenes and soliloquies. Members prepare performances for Camden Catholic’s Shakespearean Festival, and compete in the Shakespeare Competition at DeSales University. Open membership. Sketch Club: Students interested in drawing have the opportunity to learn drawing techniques and create their own personal sketchbooks. Social Studies Honor Society: Members are committed to respecting human dignity and democracy, and pledge to strive to improve the social, political, and economic conditions of our school, our church, the community, and the world. Membership by selection. Spanish Honor Society: Members of the San Pedro Alcantara Chapter of the Sociedad Honoraria Hispanica devote themselves to the study of the Spanish language in order to master it one day. Membership by selection. Spirit Week: Student government sponsors three days of festivities to promote school spirit and support the football team in their Thanksgiving competition against Camden Catholic’s main rival. Activities include crazy dress days, a Powder Puff Football Game, decorating the gym, games and contests, and skits relating to each class’s selected theme. Stage Crew: Students move props and sets and regulate lighting and sound during the fall drama and spring musical productions. Open membership. Student Government: Student government provides a channel of communication between students, faculty and the administration. It establishes a forum for student expression that promotes the general welfare of the school, and develops school morale and spirit and a focus for school activities. Membership by election. Thespian Society: This is the honor society for theatre arts; it is part of EdTA (Educational Theatre Association). 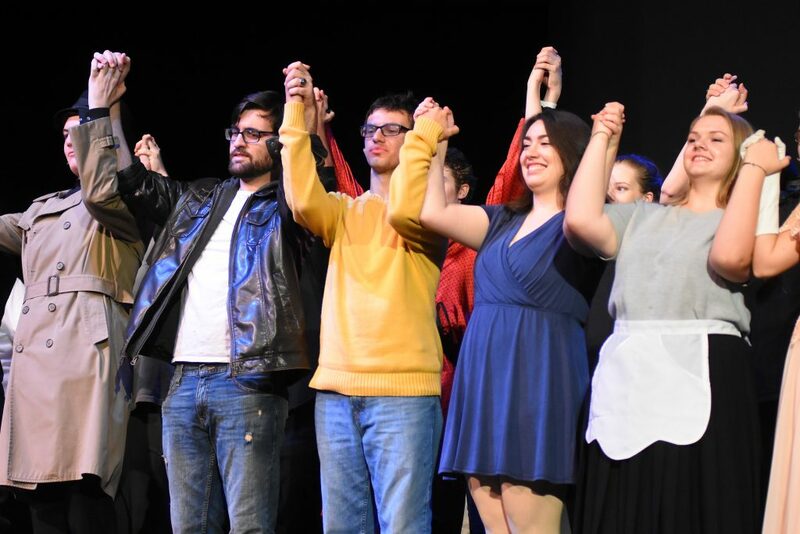 Students pledge to uphold the aims and ideals of the International Thespian Society and to perform as well as they can as a student of the theatre. Membership by selection. T.H.E (Together Honoring Everyone) Council: A student driven group with the intent to celebrate racial and cultural diversity at Camden Catholic. T.H.E. Council will host events and programming relative to our multicultural community, including Hispanic Heritage Month, African American History Month and Asian American Heritage Month. In addition, we hope to help encourage continued knowledge and acceptance of our community’s cultures, abilities and viewpoints. Membership by selection. Ushers: Student volunteers serve the CCHS community at the fall play drama production, spring musical, and at Baccalaureate and Commencement by greeting guests, distributing programs and awards, and escorting guests to their seats. Video Gaming Club: Members will be able to meet new friends while playing E and T rated video games. Open membership. Yearbook: Students work with members of the Photography Club/Class to capture memories of school events. Staff members write stories to accompany the photos. Open membership.